Congratulations to Peg Weschke from Hilton Head Island, South Carolina. Peg has been chosen as the Ponnie Brinkman Scholarship Recipient for 2012. As a new quilter, Peg has quickly been recognized by her guild, the Palmetto Quilt Guild, as a 'new-bee' who is "fun, talented, energetic and always trying something new and different." Her recent works feature beaches and African themes. 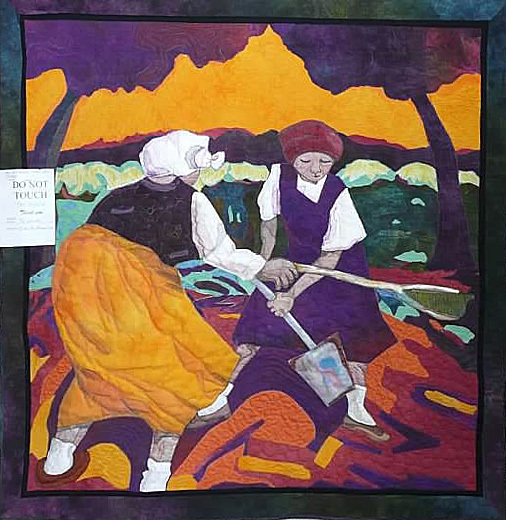 She is described as "an enthusiastic quilter who gives back to her guild and community." It is always a difficult decision to select our scholarship winner. To all of our nominees, congratulations on your quilting journey and success thus far. We encourage you to continue quilting with passion and enthusiasm. Please join us in congratulation Peg on this well-deserved honor. Congratulations Peg!! You are truly an inspiration! Wow - that's my sister! Congratulations ! Congratulations , Peg! Your work is amazing! Congratulations Peg!!! You are going to so enjoy Ricky's retreat. What an AMAZING quilt! Congratulations to Peg!! !